Homes built before 1986 are more likely to have plumbing containing lead or lead solder. New homes may also have lead. 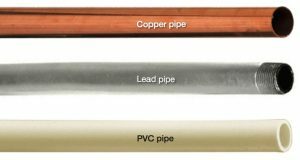 Even brass faucets, fittings, and valves, including those advertised as “lead-free” may contain some lead. Your local building/code department may be able to provide you with information about building permit records that may contain information on your home’s plumbing materials.